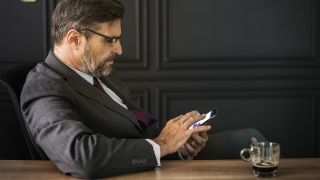 The use of mobile devices within a corporation has become an ordinary part of modern business, but having so many devices operating both within and outside the company offices can be a real headache to manage. This is especially because of the security risk they pose, as one lost cell phone with access to the company records could have serious consequences. Additionally, cell phones, tablets, and laptops all need to undergo routine software upgrades to keep them secure. The issue is made even more complicated with BYOD-Bring Your Own Device-policies, which allow employees to bring in and use their own personal mobile devices for work to help improve efficiency, while creating yet another potential security situation. This is where MDM-mobile Device Management-comes in, which are usually single platforms where all mobile devices in use can be monitored and managed. This means having a dashboard where IT professionals can see which version of an operating system is being used and whether any upgrades are required for those devices. Additionally, MDM services can ensure that any company data used on a mobile device, whether provided by the business or brought in by staff, can be fenced off to protect and secure the data. And in the event that a mobile device is lost, MDM services can help locate the device-or, alternatively, if it cannot be recovered, ensure that any company data is erased and the device locked against further use. Overall, the increasing use of mobile devices and cloud platforms can contribute significantly to business efficiency and profitability. However, without the correct MDM solution for your business, these benefits may be outweighed by the costs. All the more reason to ensure proper Mobile Device Management is in place, to protect your business, employees, and customers. System administrators can troubleshoot iOS devices, keep them up to date, manage their security, and ensure all users have the apps and services they need. All of these tasks can be automated, offering a welcome convenience factor for IT professionals at the helm. Additionally, the user interface is clear and simple to use, so unless you’re a total beginner in the world of device management, it shouldn’t take too long to get used to operating the Jamf Pro platform. The software can be run via the cloud or as an on-premise service, and also works with asset management tools, network access controllers and other IT services thanks to built-in integrations. Should problems arise, a helpful customer service team is on hand via phone, email and live chat in business hours – with a Premium Support service also available for added technical and strategic expertise. Jamf pricing begins at $2 per device per month for the Now Standard plan, or $4 per device for the Now Plus Plan. In both instances, the first 3 Mac or iOS devices are free. For the more inclusive Jamf Pro Plan pricing begins at $3.33 per month per iOS or tvOS device, or $7.17 for the top tier. Okta gives IT managers the tools to manage all the web applications entering the work environment, with on-demand identity and access management operational in the cloud and behind the firewall. Its MDM products are plentiful, including single sign-on for speedy application access, multi-factor authentication for added security, lifecycle management for controlling the movement of people in and out of the organization, and universal directory, allowing you to manage every user, app, device, and API in your organization from one place. Given the endless stream of applications and technologies entering the typical company network, potential suitors of Okta will be glad to hear it boasts integration for over 5,500 apps, including Office 365, G Suite, AWS, Slack, Salesforce, Zendesk and Splunk. Okta’s security analytics and automated provisioning tools offer peace of mind when it comes to managing employee devices. A $1,500 annual contract is the minimum requirement for Okta’s products, which are generally considered on the pricier side, though volume discounts are available for enterprise customers with over 5,000 users. There was much concern and consternation when Android devices first penetrated ‘the enterprise’, with many regarding the OS as somewhat insecure compared to business favorites BlackBerry and iPhone. But with device management solutions like Mobilock Pro now in the market, IT managers are increasingly relaxed about an Android presence in their organization. MobiLock Pro is a cloud-based platform enabling users to control all their company’s Android devices. At the heart of the management controls is the system’s ability to lock devices into kiosk mode, replacing the standard device home screen with a customizable display that limits which apps and websites can be accessed by users. Control is further enhanced by making certain OS functions inaccessible – preventing employees from adapting device settings or installing unapproved apps – while websites can be blocked and whitelisted. Administrators can also push files to devices from their dashboard, remotely send alarms to make devices ring, send out one-way message broadcasts to any number of registered devices, and remotely wipe all images, videos, and audio files from device galleries. But it’s not all bad news for the device carrier, as they can create device profiles with customized branding and use the pre-selected list of apps and websites at their leisure. Pricing for Mobilock Pro begins at $30 per device per year for up to 25 devices with the Starter Tier. Pricing is reduced per device for the Mobilock Pro and Business tiers: the Pro tier costs $24 per device per year for between 25 to 100 devices, and the Business tier is charged at $18 per device per year for over 100 devices. ManageEngine Mobile Device Manager allows you to manage your organization’s mobile assets while maintaining strong security. It is available as both a cloud and on-premise service, and works across both Apple and Android devices. Mobile Device Manager boasts a wide array of features and tools: device enrolment provides platform-specific bulk enrolment options, and device management enables remote control of devices in real-time with the ability to set up profile policies depending on department or hierarchy. The there's app management which can blacklist certain apps in the business side of a user’s device (which is kept separate to their personal profile), along with mobile security that safeguards assets and information through passcodes, geo-fencing and remote locking and wiping. Remote troubleshooting allows you to remotely view and control devices in real-time, and mobile content management pushes documents and other resources to employee devices. Finally, audit tools can update admins on the device count in the network, see what apps are being used by whom, and spot if any go outside of the set boundaries. Pricing is free for the first 25 devices with both the Standard Edition and Professional Edition pricing tiers. After that, for the standard package, prices start from $10 per device per year-which is pretty good-with the professional tier charging just $18 per device per year. Aimed at small and mid-size businesses, healthcare companies and service providers, Miradore Online is a cloud-based MDM, looking after smartphones and tablets running Android, iOS and even Windows Phone. Among the control features are passcodes, device encryption and remote locking – plus the ability to wipe the device of all data should it be lost or stolen. Matters are better still for iOS devices in the network, as these can be put into Lost Mode, locking the phone or tablet and displaying a contact number for those who may find it. For bring your own device (BYOD) implementations, the nifty selective wipe feature enables the removal of all company-specific data from a device, while leaving personal data intact. Elsewhere in the platform, Miradore Online has tools to track the location of all devices (with information including longitude and latitude, zip code and street address), the ability to configure email, Wi-Fi, and VPN settings, plus restriction options can be set on data roaming, web content, and app availability. There's a free tier offering a free MDM solution for small businesses, with the Business tier with more features charged at $1 per device per month. Another MDM service that covers iPhone, Android and Windows is SureMDM. Producer 42Gears describes the product as a simple and ‘lean’ solution for the enterprise, targeting SMBs and startups. Features include application deployment, security policies, location tracking, screen sharing and remote troubleshooting. This is not to be confused with Simple MDM which specializes solely in the management of Apple devices. With Simple MDM, organizations are able to secure company assets and data on mobile devices by hiding apps, disabling functionality, implementing passcodes, blocking ‘dangerous’ iOS features, and more. Another notable market player is Hexnode MDM, which also covers iPhone, Android and Windows. Stay on top of devices in your network through individual and group management, a kiosk mode, app management, web filtering, tracking, geofencing and expense management, among other features. VMware AirWatch running each of the three key mobile operating systems and does so with a raft of tools and features. Choose from three management suites (staggered in price) and keep devices up-to-date and secure via a well-designed, easy-to-use central dashboard. Cisco’s enterprise ubiquity stretches to mobile device management too, thanks to Cisco Meraki. The cloud-based platform provides centralized management, diagnostics, and monitoring for all the mobile devices managed by your organization, from iPads and Androids to Macs and PCs.